It’s hard to think in terms of laughing in the face of illness, disease, or hardship of any kind. Lately I’ve had friends that are far from being physically or emotionally “in good health.” They’re either going through treatment, recovering from treatment, or anticipating some kind of treatment. Some brave souls are just white-knuckling it, and hoping for the best! It’s difficult times for all of them, their loved ones, and special friends. It’s hard to know how to help, to bring some sunshine into their lives. Not every person can be a Norman Cousins, or even have the energy or want to read Anatomy of an Illness, his best-selling, groundbreaking book. The book’s concept is simple, to use humor to boost the bodies’ capacity for healing. I thought of a picturesque way to get this message across, and to help bring some, from my window, California sunshine into those special friends’ lives. The idea is much the same as my world-wide Welcome Page Sunset Gallery, where fellow bloggers can visit, and rest their minds. I hope you find a smile here, or better still a good belly laugh! This entry was posted in My Blog, My Entries and tagged Canned laughs, Find humor, Gallery, Give help, Happy pills, Healing, How ro help, Ill health, Laughter heals, Laughter is the best medicine, Norman Cousins, special friends, Sunshine, Sunshine from my window. Bookmark the permalink. 14 Responses to Laughter is the Best Medicine! Thanks Jodi, happy you’re smiling and laughing in Mars! I liked the last one best too. It was fun putting this together for really everyone, not just those friends suffering illnesses, etc. 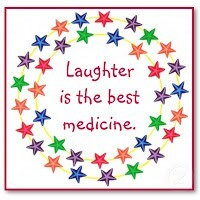 We can ALL use laughter and a gentle nudge about the healing effects of humor. This reminds me of the walls of my dermatologist’s office – alongside the gruesome photos and warnings about melanoma and other skin cancers, there are bulletin boards filled with cartoons about doctors, medicine and even some specific to skin ailments. I actually get a boost from these and it makes my visits less anxiety-producing. Sammy D., thanks for your comment. What a good idea for a doctor’s office! More should do that. It would at least distract patients’ attention and make them feel better. “The nice nurse is on vacation”…love that one. Van, me too! Maxine is pretty awesome! Thank you for making me smile. Made my morning good! Well, good! So glad you had smiles on this morning. Laughter is good for all things! Thanks so much, Ralph! The kittens were my favorite too! I though medicine was the best medicine.. but these rock!